The rising popularity of designer drugs like marijuana-like “spice” and so-called “bath salts” concocted with chemical combinations meant to give users an illegal high has emergency medical responders grappling with users who risk losing their lives – or minds – for a cheap fleeting euphoria. Worse, using bath salts could make your life seem like it is a real nightmare and cause hallucinations and paranoia so you believe your roommate and your girlfriend have turned into crazy demons. That’s the gist of a video that Navy Medicine created last month as a public service announcement to deter sailors and Marines from using the powdery drug. 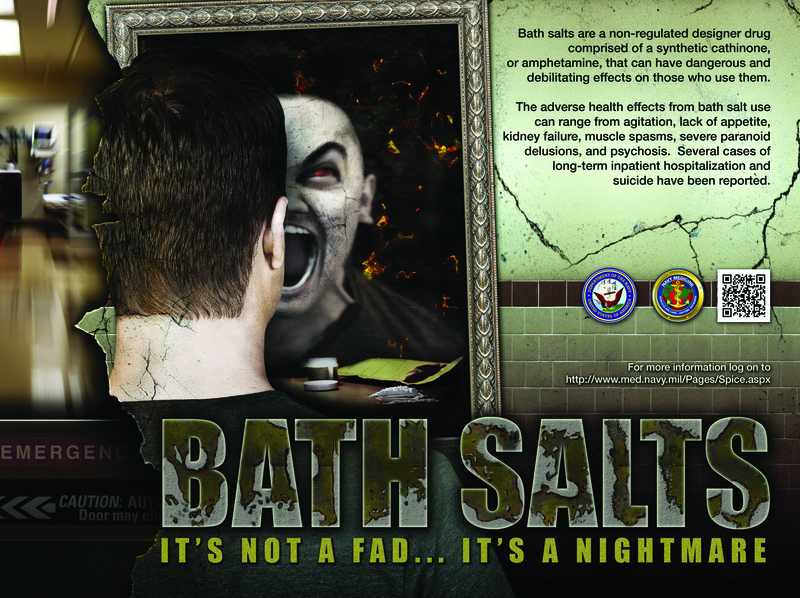 The images have drawn nationwide attention to the video, the Navy’s latest public service announcement to dissuade sailors and Marines from thinking bath salts are trendy drugs that could skirt detection in drug tests. But Navy medical officials say that the danger of bath salts is no joke. “These are destructive substances,” Lt. George Loeffler, a psychiatry resident at San Diego Naval Medical Center who has studied cases and seen sailors and Marines admitted into the hospital’s psychiatric ward for treatment, told us last week.